[I had some fun, light stuff to post today, but after the shooting in Aurora, Colorado – not 60 kilometers away from where I sit – I think I’ll hold off posting them for now. On July 20, 1969, at 20:17:40 GMT, human beings landed on an alien world. That was the moment that the Eagle lander touched down on the surface of the Moon, 40 years ago today. Nearly five hours later, at 02:56:15 GMT on July 21, Neil Armstrong placed his boot in the lunar regolith, planting it firmly into history as well. You can read all about this event and its global and historical impacts all over the web, so I won’t belabor the point here. But the Apollo missions mean something special to me, so forgive me this small indulgence. While the overall significance of the missions is interesting and fun to think about and discuss, the real stories, the ones that sink in, are the personal ones. I was four when Armstrong, Aldrin, and Collins approached the Moon. That’s old enough to form memories of the event, but young enough that those memories are malleable; I have a hard time distinguishing what I actually saw with what I may have seen years later on TV. I seem to vaguely remember sitting on the couch with my family watching the events unfold; even at that age I was in love with science fiction and all things spacey. It’s possible my parents let me stay up late to watch that first step. It would’ve been 11:00 p.m. at our old home. But honestly, I don’t remember. However, just a wee bit over two years later that changed. In July 1971, my parents rented a Winnebago — a monstrous recreational vehicle — and the whole family piled in so we could road trip down to Cape Canaveral. If all went according to plan, we would be there in time to watch Apollo 15 launch and make its way to the Moon. I was six, so I remember this much better. The bathroom on the RV smelled overwhelmingly like fruit. My sister taught me that it’s OK to lie when you say something if you cross your fingers while saying it. We stopped to visit friends of my mom’s in South Carolina, and again in Georgia so my oldest brother could check out the Georgia Tech campus before applying there the next year. I have lots of other memories that are trivial to others but which I cherish. But still and all, we finally reached Kennedy Space Center. I remember touring the area, and I also remember being on the tour bus and getting up pretty close to the Saturn V. I wonder now if that’s a distorted memory; it’s hard to imagine they let tourists get as close as my semi-fuzzy recollection indicates. And then the day arrived. We parked on the banks of the Banana River and waited for the moment. I wandered off a bit to play on my own (times were different then), and I distinctly remember finding a blue plastic kiddie pool upside down on the river bank. I flipped it over, and a billion mosquitoes exploded out of it! Not too surprisingly, that’s one of the stronger memories I have from that day. And then the moment finally arrived. I remember nothing of the countdown, but boy oh boy do I remember the launch. A man next to me had a camera that he was frantically snapping away with; I remember the noise of the shutter and him winding it, trying to keep up with the rocket lifting off into the sky miles away. I can still picture the mighty Saturn V as it punched upward. It was magnificent, and even at the age of six I had some idea of what this all meant. I stood there, clutching the little scale model rocket my parents bought me on the KSC tour in one hand, and the blue plastic figurine of an Apollo astronaut standing on the Moon I had in the other. I still remember bringing that plastic model to school for show-and-tell when we got back home. That memory of the launch is a powerful one for me even today, all these years later. I asked my dad years later what motivated him and mom to pack the whole family up into that RV and take us down there. He replied that it was something he thought we should all see. It was history being made in front of us, and not something you get a chance to see very often. I asked him that for another reason. My father was a quality control engineer, and did a lot of government contract work. In fact — and this makes me proud, let me tell ya — he worked on the quality control for the astronauts’ food program. I don’t know what precisely he did for the program, to be honest, but he was involved for some time. I know he did some work on the packaging, including the freeze-dried food and the spaghetti the astronauts took with them. That’s why I asked him why we went to see the launch; I wondered if it was because the trip was work-related for him. But it wasn’t. He and mom wanted to share with us the sheer joy and wonder of humanity’s first tentative journey away from Earth. We should all strive to be such people. Years later, when my father died, my mom asked all us kids if we wanted any of his books or other items. I stood in front of his bookshelf, admiring the many texts on codebreaking, mathematics, the history of cryptography. He was fascinated by these topics, and was something of a dabbler in math; a formula he invented is published in the CRC handbook used by grad students across the planet. 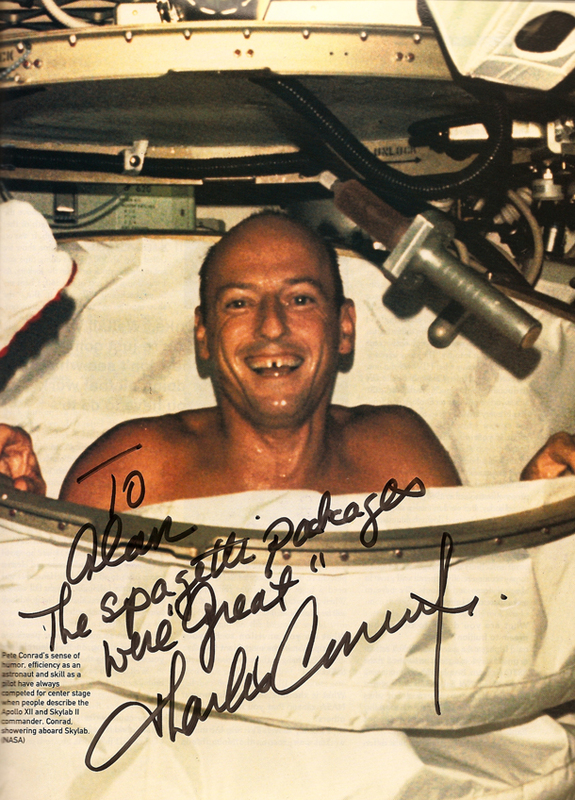 That’s Apollo 12 astronaut Pete Conrad, the third man to walk on the Moon. Clearly, dad must’ve met him and talked about the food program. Conrad had a great sense of humor, and signed the picture appropriately. My dad was a major reason I’m a scientist now, and helped instill in me and all my siblings a love of science and space. My memories of Apollo are inextricably entangled with memories of my father from back then too. So to me, Apollo is personal. I can take a mental step back and look at the whole picture: what that one small step meant, how it inspired a planet, what NASA did that day, and even how its faltered in many ways since then. But sometimes the real story, the human story, is the first-person account of events. That’s how it plays in my head when I picture that hot July day in 1971, and that mental film is always running when I write about Apollo. It may not be at the forefront of my mind, but it’s there. Even without it I might still be inspired to write what I do. And though I strongly doubt it, I suppose it’s remotely possible that I’d still be where I am today without having had my parents expose me directly to space travel. But they did. And I’m a better man for having it as a part of me.